I don't have it I'm still waiting for the company who made it to return my email. Yah, I noticed that as well... the finished products looks good. I was quoted 1080.00 and a one month manufacture wait for this system. 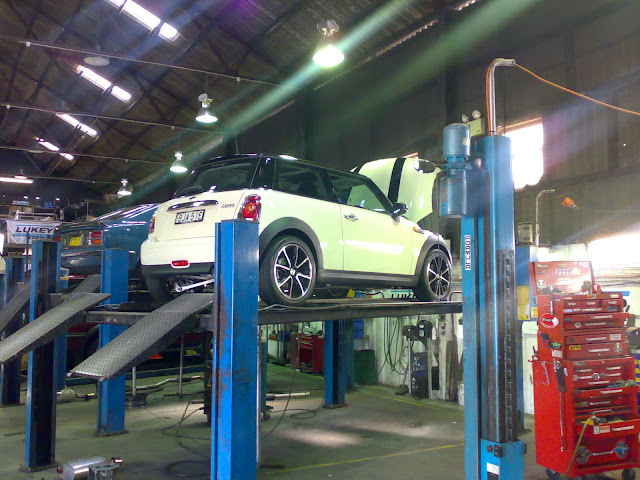 I just had the stock exhaust on my R56 MC replaced with an off the shelf sports muffler here in Sydney by a reputable exhaust shop (Carline). I basically told them that I'm after a muffler that would give me a bit of a deeper tone and improve the flow a bit. Not the racey & attention seeking sound. Although they were a bit unsure of the outcome as they have never done one before, they recommended a type that they think will do the job. Lucky for me it was just perfect! The sound, flow, feel & look I was after. I no longer feel that I'm driving a 1600cc car but rather it feels more like a 2.5L stock turbo (WRX). And definitely the engine feels more unrestricted and flows a lot better. Just perfect. Cost me a total of A$330 (approx. US$210). It maybe worth seeking the advise of your reputable muffler shops. any idea what brand that muffler is choova? I was thinking about ordering a magnaflow muffler from the US and getting my mate to fit it for me. Since I'm on a tight budget, I tried a low cost expierment. Installed a Magnaflow muffler on my Cooper. My fabricator welded the original tip back on to look stock. I am pleased with the sound, (very mellow on the road) and not loud or farty. There is a pic in my gallery pics as well as a short sound video. My wife has commented the car seems more responsive, (she is a non car anything) and our gas mpg has gone from 28/38 to 32/44. also dropped in a K&N air filter. Hopefully, I can do a drive by sound shot sometime. What size is the muffler Waterman? I've been looking at ordering a magnaflow muffler but not sure which size to get. also, as you can see in my pic, I had the muffler sprayed flat black color. Originally it had a satin finish. It also tucks up nice underneath and basically cannot be seen from behind like the stock one. Figured I'd bump this thread. For those interested in an aftermarket systems here's Supersprint's full setup. That header looks nice. I dont want to cut off my muffler, I'd much rather get a direct bolt-on catback exhaust for my r56 base cooper. Does anyone know where it can be found?? or if one even exists? I've been searching and haven't found a single one. How can this be? There are several cat-backs for the 1st gen base cooper. It's been over 2 yrs since the r56 launch, how long did it take for the 1st gen aftermarket exhausts to come out? I went down to my local muffler shop and had a cat-back magnaflow installed for less than the cost of a diy kit online. I have seen kits for 600-700 dollars, and I only paid 450 installed. No getting dirty, no hassle of parts not fitting, no headaches. Half hour later it was welded by a pro and sounded better than the JCW. Has a low growl...not that weed wacker sound on all these imports now-a-days. Yep that would work but you will get a CEL and will run rich. If your state has emissions inspection make sure you keep the factory pipes with both the cats or bribe the inspector. Also that setup isn't on the OBX site so I'd call them before buying it. Last edited by Oxybluecoop; 07-02-2009 at 06:51 PM. i am very tempted to do this. never done anything like this before. i feel like i can't even hear my oem exhaust over the engine. i don't like attracting attention, though. if u don't mind me asking, how much? 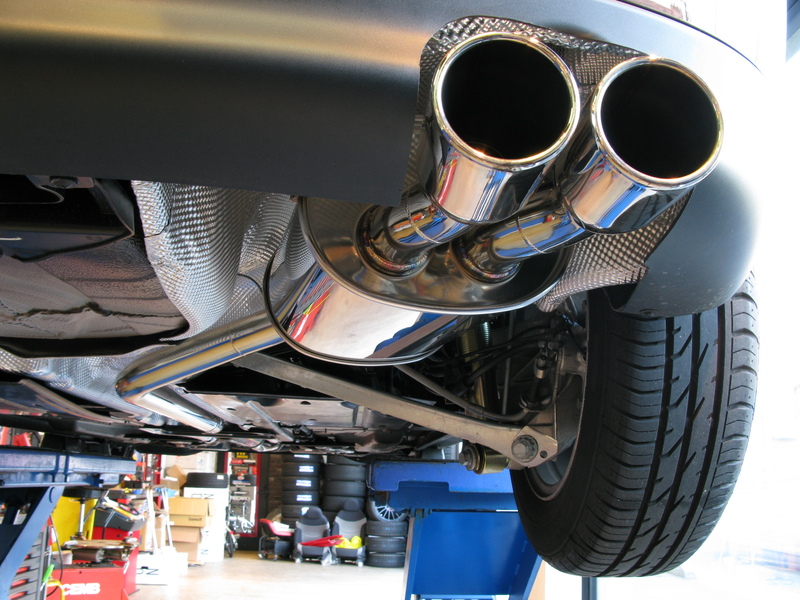 I have seen several Magnaflow mufflers in Pepboys and other auto stores, usually ranging anywhere from $60-$100. guess it's cheaper to get my own and them bring it to a shop? i've seen the one Waterman used online for $70. i'm wondering how much the install usually is to swap mufflers? grumpy said his setup was $450. i'm guessing that's cause he had them fabricate a whole new catback? otherwise, seems expensive. anyway, i'm just being lazy for now until i get around to calling up some local muffler shops. parts wise it was 225 for the new pipes, muffler, new tip and resonator(all three magnaflow). labor was 225, but it was worth it to me to have them do it so it was welded up and fit perfectly with no pre-bent pressure robbing pipes. I could have gone with just the muffler, but figured doing everything would sound better and let my car breath a little easier. It did not void any warranty work either as I just had the recall done on my cat last month. oh, so you replaced the front pipe as well, removing the second cat/silencer? $450 sounds like a good deal. I was quoted $650 at a place I checked out in Buffalo. Whatever you do make sure you go to a reputable shop even if it costs a few extra bucks, and definitely make sure the pipes are all mandrel bent, or it would just be a waste of cash IMO. Being in the lovely smog **** capital: California, I couldn't remove the resonator/silencer. I just had them replace it with one that breaths a little better. The guy at the shop told me I had to keep it to stay legal. And yes you will pay what seems like more to have it done by a pro, but I would not honestly do it any other way. I had them go 2.25" from the cat back, going any bigger wouldn't have made any difference in power output. And if you go in with your own muffler, they probably wouldn't charge you anything more than an hour flat rate(50-70 bucks) to weld it up. I checked into all options online ie: megan, borla, etc...and for what you get having one built for you is way cheaper than buying a kit and doing it yourself. grumpy00, for all that, it certainly does seem like a good deal. thanks for the details. drewstermalloy, don't worry, i'm going to baby my mini properly if i commit her to exhaust surgery. i'm going to baby my mini properly if i commit her to exhaust surgery. With all the electronic stuff you have, if you get a good sounding exhaust and intake, you're going to have one sweet ride on your hands. speaking of intakes, i decided to get VIP custom's solution. i already got the K&N drop-in panel filter, so i ordered the $109 tube in black (supposedly available in that color by 7/22). i'm trying to keep as discreet an oem look as possible. as for exhaust, i probably plan on mail ordering the Magnaflow one Waterman used, and get it swapped by a reputable shop and keep the oem tip as well. was the flat black finish to help conceal the muffler from the cops? if so, i guess i should do the same here in NYC? i better start working more shifts cause i'm not going to be able to resist the temptation of ecu tuning as more options become available for our coopers. I believe in NYC it's more about the sound than the concealment...Geez, half the cars in NYC needs a muffler or shouldn't be on the road.